2008 7.5Yanmar excavator little over 1000hrs ..in excellent condition only used for personal use..$64.000plus hst. Call for more information. 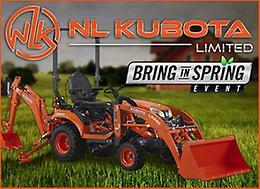 2016 Kubota KX040 Excavator ... just arrived. Fully Serviced and ready to work. Mint condition. Low hours (1493-hrs)... SAVE THOUSANDS off the price of New, at just 54,900+HST. In-house financing. • 40.9 HP • 4.5 Ton • 11’3” Digging Depth • New Spacious Deluxe Cab with Heat and AC • Auxiliary Hydraulic Flow Control • Load Sensing Hydraulics • 3rd Line Return • Rubber Tracks recently replaced • 4-Way Angle Blade • HYDRAULIC Quick Coupler • 2 Buckets ... 24” Ditching Bucket, 42” Trenching Bucket The Kubota KX040-4 combines superior strength, versatility and performance to deliver one of the most balanced mini-excavators on the market. Incorporating industry leading technology, the Kubota KX040-4 produces less noise, reduced emissions and is equipped with eco mode, which can generate fuel savings by up to 20%. Now with an angle blade model in the lineup the Kubota KX040-4 sets the benchmark for all other mini-excavators to follow. Model HX220L - 23 Tonne Excavator - 173 Net HP - 1.375 yd3 Severe Duty Bucket & Quick Coupler. -- 3 Year/ 3000 Hour Warranty Standard -- For a Limited Time 5 X 5 Lease Package -- Hi MATE Telematics FREE for 5 years. -- Payment As Low As $3,866.77monthly* Added Features -- Intelligent 8" Touchscreen Monitor -- Innovative Haptic Control Module, Haptic control is a common technology found on luxury automobiles that makes selecting menus and adjusting settings easy. -- Deluxe Operator's Seat, Advanced Audio System, Cab Air Filter Access. -- Rear View Camera. -- Other Financing and Leasing Options Available. -- Call dealer for Pricing. * Payment subject to approved credit, based on standard equipment, while quantities last, machine may not be as shown. Now avaliable the New Hyundai HX145LCR Radius Excavator "TOMORROW'S EDGE TODAY"
Model HX145LCRD - 14.5 Tonne Excavator - 116 Net HP - .875yd3 Severe Duty Bucket & Quick Coupler. -- 3 Year/ 3000 Hour Warranty Standard -- Hi MATE Telematics FREE for 5 years. -- Payment As Low As $2,994.83 monthly* -- Dozer Blade. --The 8-inch interactive touchscreen color display - with centralized switches - allows the operator to check and manage most features of machine operation, switches and diagnostics, all in one convenient location. --The audio system includes an AM/FM radio, a USB-based MP3 player, an integrated Bluetooth hands-free feature and a built-in microphone to allow for phone calls while at work and in transit. --Seats are fully adjustable for maximum operator comfort with air suspension, selectable heat and adjustable arm rests and control consoles. --HX series excavators are equipped with large grab rails, guard rails and a proprietary anti-slip surface on the upper structure that make accessing key service areas easier and safer. -- Financing and other leasing options available. -- Call dealer for pricing. * Payment subject to approved credit, based on standard equipment, while quantities last, machine may not be as shown. *Was sold but buyer did not pick up* Have a bucket for sale. See pictures for sizing. Great shape. Email any questions. Make an offer. Volvo ecr235 bucket cylinder, was removed before taking delivery when new, may fit other models, includes the lines.